As the Transformers: Generations Combiner Wars Devastator is hitting retail, Hasbro has posted a small commercial demonstrating the toy. “Devastator is a raging hammer of chaos, battling voices in his head one minute, then crushing his targets the next. He is the perfect weapon, held back by a single imperfection: the Constructicons struggle to successfully merge their thoughts into one cohesive action, making it difficult to focus the wrath of their combined form. If they were able to harness the full force of their collective power, they would give the Decepticons a weapon capable of pounding entire civilizations to dust. As long as that threat exists, Devastator will loom as a shadow across the universe, an enemy the Autobots — and all the worlds they protect — must fear. Check out the video, after the jump. Thanks to board member Pavol Palat, we have a report that Combiner Wars Deluxe wave 3 (consist of Blades, First Aid, Rook, and Streetwise) and Legends wave 3 (with Warpath, Groove, and Viper) was found in an Alltoys store in the town of Nitra. Does this mean Deluxe Wave 3 will be arriving at the rest of Europe soon? Run for the hills, protect your children, prepare for a rampaging fandom as they run to stores. 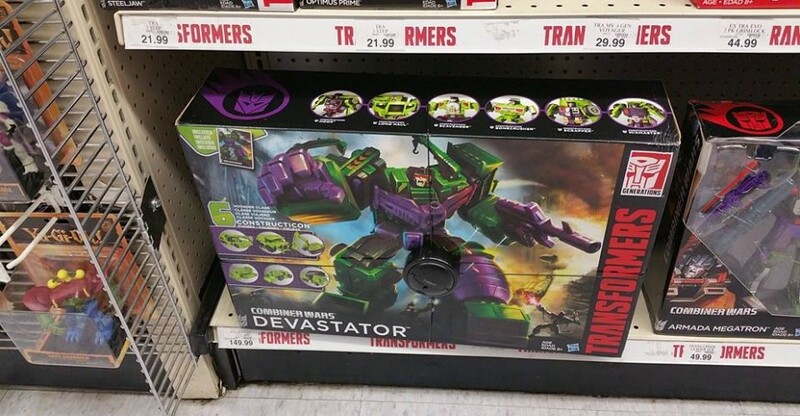 Combiner Wars Devastator has been sighted at a Toys ‘R Us store in Sunnyvale, California. Devastator can devastate your home for the wallet-emptying price of $149.99. Board member Magnoir has graciously share images of in hand images of TakaraTomy United Warriors UW01 Superion with us. He shows off the individual members of Superion in vehicle mode, close ups of the robot mode, and combined mode. You can see the subtle attention to details from TakaraTomy’s release that makes them very accurate to their G1 counterparts. The best bonus of the United Warriors set though is probably the small lithograph of original art depicting the Aerilbots having an Energon Barbecue on top of Metroplex. The Transformers Hong Kong Facebook community page has shared a new promotional video for the Combiner Wars toy line. This action packed video shows off the Combiner Wars toys in motion through some awesome computer animation sequences. If this doesn’t get you hyped about this line, I don’t know what will. This is definitively a great way to get more people excited for the toyline, and we hope this will be shown on TV and other popular venues to reach a wider audience. Before that happens though, check out the clip and tell us what you think on the boards! The Combiner Wars news continues to rush in! This time, we have box artwork to what appears to be a package of three fembots – Arcee, Chromia, and Windblade! This image comes to us courtesy of TFND’s Facebook page, and thanks to TFW2005.COM member Slimaximus for pointing us all to it. Forum member Cheem The Rup shared an update. A second image showcasing new artwork has been released by TFND. It has been added after the jump. The artwork suggests a few things to us. The reflection of Devastator in Arcee’s meelee weapon and the fact that this is a boxed set may be an indication that this set will be a San Diego Comic Con exclusive, as the sets could be made to “face off” with each other. There are several notable details that suggest additional paint applications (such as the Autobot faction symbol on Arcee’s face) that could indicate a “Premium” type of release, which would also be consistent with a SDCC exclusive release. Is this something you’re excited about? Be sure to join into the ongoing discussion to share your thoughts with us after the jump! 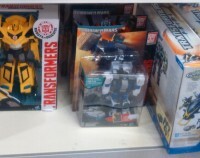 For all you transformers fans in the United Kingdom looking for wave 2 of Combiner Wars figures, it appears they have been sighted at a Toys R US around Sevenoaks. Unfortunately, it looks like this version does not include the pack-in comic we have seen thus far. Nonetheless, the figures are out there in the wild now, so happy hunting! Combiner Wars Megatron Released in Germany! Well, good news for our friends in Germany, user Nevermore Spotted both Combiner Wars Megatron’s at a Toys’R’Us in the city of Essen and then again at Duisburg. Hopefully the rest of Europe will be getting these in soon as well! Discuss this and check out the rest of his picture after the jump! Good news for Generations fans this morning, as we have a new toy sighting for you. 2005 Board member harveydent reports finding wave 2 of Combiner Wars Legends figures at his local Toys at Us in Alexandria, VA. This wave features Huffer (a retool of Legends Optimus with a new Huffery-looking head) and an updated Micromaster in the form of Blackjack, who can form the chest piece to your Combiner Wars Menasor! Click on the title bar to see the photo proof and make sure to share your sightings in our sightings forum! Hasbro has uploaded a new gallery to their Official Transformers Facebook Page to take a look back at the Transformers 30th Anniversary Thrilling 30 Exclusives toyline. For those who do not have access to Facebook, we’ve mirrored the images with this news post. You can find them after the jump. What do you think of the 30th Anniversary Toyline? You can join the ongoing discussion for the Thrilling 30 Exclusives, by visiting the Transformers Toy Discussion forum at 2005 Boards.